Beat egg yolks until thick and light in color. Add cream, salt, pepper, and parsley. Beat egg whites till they form peaks then fold into yolk mixture and gentle toss in mushrooms and onions. Pour into a hot buttered cast iron pan. Cook slowly until omelet puffs up and is firm on the bottom. Place into a preheated oven 350 degrees for about 3 minutes then sprinkle brie on top and bake for 2 more minutes. 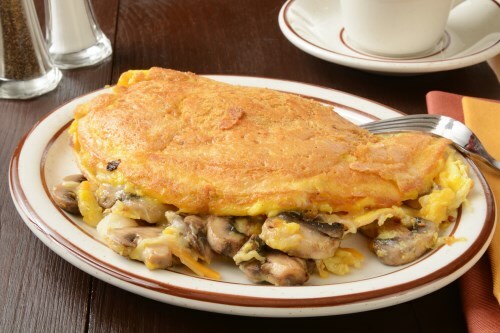 Fold omelet in half and serve.